New: United States trained the new Islamic State military commander! On Monday, August 29th President Obama reached his goal for 2016 when refugees entering the United States from Syria reached a total of 10,000. On that day, 224 new Syrian refugees arrived. That brought the total for this fiscal year to 10,126. Of the 10,126 Syrian refugees, just 52 — or 0.51 percent, are Christians; and 9,945 — or 98.2 percent, are Sunni Muslims! Despite the fact that the United Nations, the U.S. Congress and the State Department had all declared that Christians and Yazidis are victims of genocide by the Islamic State in Syria, just 14 Yazidis were admitted with the 52 Christians. The Islamic State is based on the Sunni branch of Islam and holds that Shiite Muslims are apostates. The Islamic State, formerly called ISIS, has killed thousands of Shiite Muslims along with Christians and Yazidis, yet only 20 of the over 10,000 “refugees” from Syria were Shiite. The Syrian refugees admitted to the United States were chosen in Jordan by the United Nations High Commissioner for Refugees (UNHCR) which is run by Sunni Muslims. They pick refugees from the United Nations camps, who are then “vetted” by the United States. Very few high profile people have stepped forward to level criticism at the Obama Administration because of the miniscule proportion of Christians, Yazidis and other minorities being admitted into the United States. Texas Sen. Ted Cruz, former Florida Gov. Jeb Bush and Arkansas Sen. Tom Cotton have publicly expressed that the government should prioritize the resettlement of Christian refugees, an argument advanced by the Religious Freedom Coalition. Neither Donald Trump nor Hillary Clinton have proposed any legislation to prioritize immigration for the victims of genocide in Syria — the Christians and Yazidis. The high number of Sunni Muslims is concerning because all of the terrorist groups that target Christians and other religious minorities in the Middle East are Sunni. In addition, every terror attack in the United States — including 9-11 — was carried out by Sunni Muslims. National Security Advisor Susan Rice stated during a “ceremony” when Obama’s 10,000 mark was hit, that 85,000 more refugees over the year would come from countries such as the Democratic Republic of Congo, Iraq, Myanmar and Somalia. Virtually all Sunni Muslim. The Religious Freedom Coalition advocates for the forgotten Christians in the Middle East. If you disagree with the lack of Christian refugees being admitted into the United States seeking refuge, you can write to your Congressman demanding change. To find out more visit www.christianvictimsfirst.com. 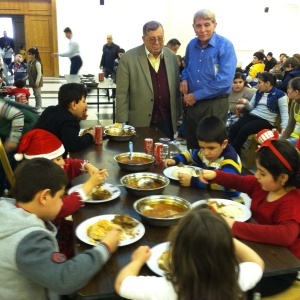 William Murray at Christmas event for Christian refugees from Islamic State terrorism. Back on track – but a long way to go: A great big thank you to all who have contributed to the Christmas for Refugees program during the last month! The Christmas program was seriously behind in fund raising during the summer months. The goal is to be able to serve even more Christian children and their families who are the victims of the Islamic State and other Islamist groups in the Middle East. The goal of the Muslims is clear – to cleanse the entire Levant (which is comprised of Iraq, Syria, half of Lebanon and Israel) of Christians. We are closing in on the 25% point in our fund raising goal, which is very good considering that 75% of giving for Christmas programs comes in October and November. The goal in Iraq is to expand the program from 300 Christian families in 2015 to 2,400 in 2016. That comes to an eight-fold expansion! Our ministry partner in Iraq has assured me that the volunteers will be ready. Room will be made in the shared ministry warehouse for the gifts and other supplies that will arrive in late November and early December. This is good news because new services that are a part of the program take up warehouse space. We are praying for a very large matching gift campaign in October. A matching gift challenge will encourage supporters to help the Christmas program at that crucial time, as their donation will be doubled. December will be a VERY expensive month for the Religious Freedom Coalition as the diaper delivery will be at the same time as the Christmas programs for the children. An answer to prayer would be for 100% of the funds needed for the December Diapers for Refugees distribution to be on hand as early as October. The full payment for the Diapers for Refugees distribution of 160,000 diapers in September has been transferred to Iraq … this was $18,000 for the diapers and for the actual distribution costs. The need now is to have the $18,000 for the December distribution in the mission escrow account as soon as possible. This year I am really looking forward to being in Iraq for both the diaper delivery and the Christmas program! Changes to the Christmas program: Because of the number of families served and the various places in Lebanon, Jordan and Iraq, it is not always practical to deliver a food package to the families of the children for Christmas. In some cases, the need for other essentials is greater than the need for food, which families may be receiving from other ministries. In those cases, each family will receive a hygiene package equal in value to what the food would have been. The hygiene packages will contain items the refugees have difficulty in getting such as shampoo, toothbrushes, toothpaste, soap, laundry and dish detergent, sponges, tissues, toilet paper and feminine hygiene supplies. The Religious Freedom Coalition is one of very few groups supplying feminine pads, which are considered an unmentionable in Middle Eastern societies. Because feminine products were not mentioned to ministries, they were not supplied. The items in the hygiene package will of course vary depending on the location and the need stated by local ministries. The goal is to supply what is needed most while at the same time supplying the hope of the Gospel truth. Please pray for the success of the program and safety of the children this year! Constant pressure on Congress: Every single day congressmen and Senators receive postcards printed and distributed by the Religious Freedom Coalition. When I visit congressional offices the staff is familiar with exactly what we are doing to help stop the slaughter of Christians in the Middle East, because they have to categorize and answer the cards! The postcards have an effect on the staff, which means they have an effect on the congressman or Senator. Over the past two years, almost two million pre addressed cards have been mailed to social conservatives and most of them have made their way back to Washington. (See TerrorPostCard.com) Sometimes people send the cards back to me rather than directly to congressmen and Senators, and I sometimes deliver these in person as I am walking to meetings inside House and Senate office buildings on Capitol Hill. The minute I hand them to congressional staff they are recognized by the front desk staff who have to sort the mail. This is having an effect on the types of legislation introduced by congressmen as well as Senators. Current legislation by David Brat and Dana Rohrabacher illustrates that attitudes on Capitol Hill are being changed. Save Christians from Genocide Act: In November 2015, Representative Dana Rohrabacher (R-CA) introduced H.R. 4017, the Save the Christians from Genocide Act. The bill states that Congress acknowledges Christians and Yazidis in Iraq, Syria, Pakistan, Iran and Libya are targets of genocide, and asks that other nations recognize this fact. The European Union and the United States have already done so. The bill seeks to have the Department of Homeland Security provide expedited visa processing and ensure that applications from the victims of genocide in the Middle East receive first priority. An applicant for a priority refugee visa must be a Christian or Yazidi from Iraq, Syria, Pakistan, Iran or Libya. The Obama Administration, which has stated that Christians are victims of genocide, is against the bill because it would “discriminate” by religion! Yet it is the Obama Administration that is handing out 99.1% of refugee visas to Sunni Muslims. In the last week I have given two major presentations on Capitol Hill promoting the passage of H. R. 4017, the Save the Christians from Genocide Act. On September 9th I delivered a Power Point presentation to representatives of nearly fifty organizations that center their work on international affairs. 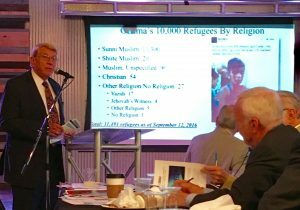 Then, on the 14th I presented the same Power Point for leaders of sixty different conservative and social conservative organizations. Religious Freedom International Reciprocity Enhancement Act: I am also currently working with the offices of Congressman David Brat (R-VA) who has introduced H.R. 5824, the Religious Freedom International Reciprocity Enhancement Act — or Religious FIRE Act. This bill would prohibit foreign individuals, organizations and governments from countries that do not respect religious liberties from funding religious activities in the United States. The effect of the bill would be primarily to limit foreign radical Islamic organizations and governments from advancing their brand of Islam in the United States by funding Islamist schools and building huge mosques. Islamist financiers in the Middle East, especially Saudi Arabia, have long funded extremist interpretations of Islam in the United States and other Western nations. While Saudi Arabia finances schools in the United States that teach democracy is an apostate religion that must be destroyed, Christians can be put to death for sharing their religion in that nation. The Saudi royal family funds its radical religious Wahhabi views in the United States but under this bill that would not persist. Only individuals and groups from countries that recognize religious liberties should be allowed to finance religious activities in the United States. I have met with staff in Congressman Brat’s office and have been working with other congressional offices to move the Religious FIRE Act forward. There are 435 congressmen. To get the attention of leadership and move bills like these forward, at least 100 cosponsors are needed. Please call your congressman and ask him to cosponsor H.R. 5824 and H.R. 4017! Yes, you read that right! 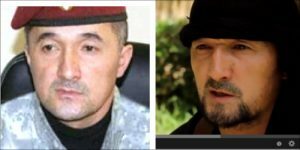 The Obama Administration just posted a $3 million bounty for Gulmurod Khalimov, the new Islamic State military commander. It turns out Khalimov was trained as a police sniper by the State Department in an anti-terror program as recently as 2014 while he was serving in the security service of Tajikistan. He is the replacement for Tarkhan Batirashvili, aka. Umar al-Shishani, who was also trained by the United States as part of the Georgian army. He was killed fighting for the Islamic State in July in Iraq. We must stop programs such as this that aid Islamic terrorists!